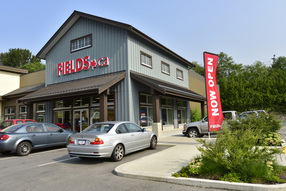 FIELDS stores have been owned and operated by FHC Enterprises Ltd. since May 2012, but have dotted the Canadian landscape for many years. For almost 70 years, FIELDS has been a central part of many rural Canadian communities and we’re proud to share in such a long and rich history. If you’ve ever done a road trip across Western Canada, it’s likely you’ve seen or visited a FIELDS along your route. To many highway-bound Canadians, the familiar red lettered sign means a place to buy pretty much anything you might have forgotten at home! For the communities surrounding our stores, FIELDS is the place to find everyday items and much more – often saving a long trip (and the cost of fuel) to “the city”. From housewares and sporting goods to footwear and fashion, you’ll find it at FIELDS. To help our customers live a better life for less. To become the leading small town value merchant in Canada by serving community, customers, and each other. Passion to serve. We are passionate about serving our customers. Respect. We respect one another and those around us. Integrity. We act with integrity. Do the right thing. We do the right thing because it just FIELDS good. Enterprising. We are a professional and enterprising family. Something you may not have been aware of: FIELDS is one of the very few successful retail chains that is actually owned by Canadians! I am very proud of that fact. I am also very aware that Canadians are extremely value conscious consumers, seeking out quality and low prices, wherever they can find it. That’s why our buyers scour the markets not just here in Canada but throughout North America and the Asia Pacific region. We buy both from domestic and overseas sources, to ensure you are getting the best possible value for your hard-earned dollar when you shop at FIELDS. We've also recently introduced a “very best price guarantee” and we have a very liberal return and exchange policy. All with an eye to making sure we take the hassle out of shopping. Anyway, as always, I will sign off with a request that if you have any comments about any of our stores, or any suggestions about how we can serve you better, I would be delighted to hear from you! Thank you for your business, we all appreciate it.